On the left, we have a Banana Republictipped five-button cardigan. Cost: $89 on Bananarepublic.com. Crucial details: v-neck; five-button placket; 80% silk, 15% cotton, 5% cashmere; hand wash or dry clean; imported; available in navy or medium heather gray. 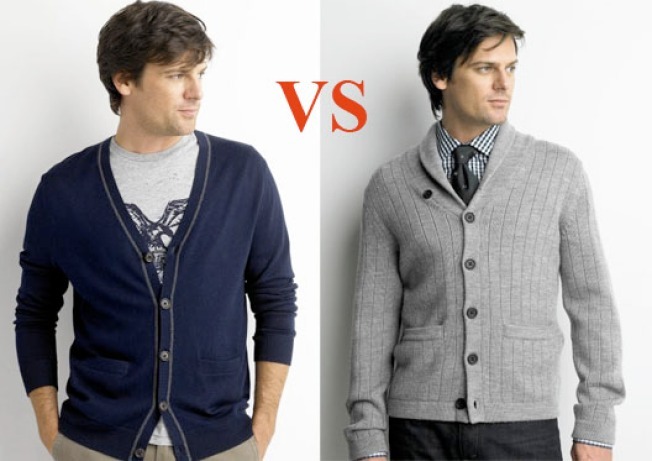 On the right, we have a Banana Republicclassic shawl-collar cardigan. Cost: $130 on Bananarepublic.com. Crucial details: shawl collar; six-button closure; two front pockets; 80% wool, 20% polyester; hand wash or dry clean; imported; available in medium charcoal or saucy red.